Mongoose IBOC Pro SX 94 same a Giant Cadex? Post subject: Mongoose IBOC Pro SX 94 same a Giant Cadex? Haven't been here for a while (sadly). But now I am turning to the collective knowledge on this forum again. 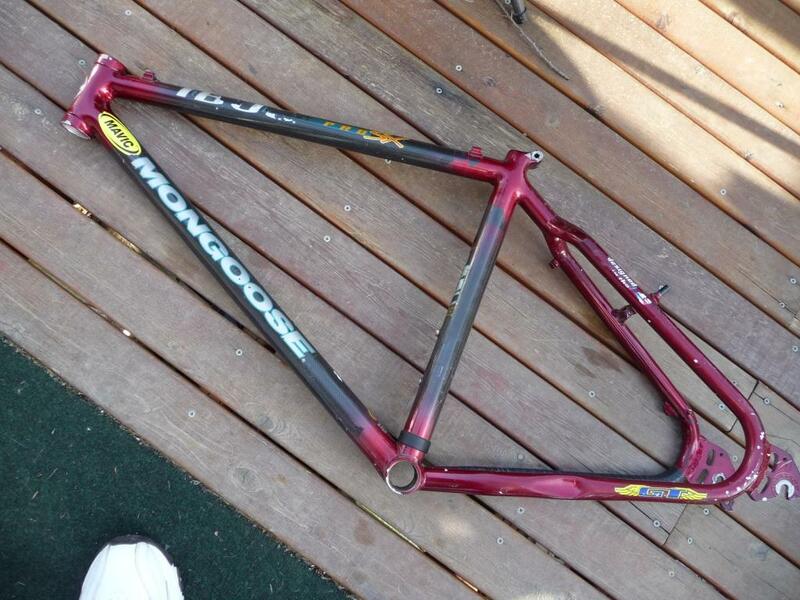 So I bought a Mongoose IBOC Pro SX from 94 a while back and I am currently using it as a retro-mod project (frame hadpoor paint, chainsuck etc but still in one solid piece) right now. Now the frame is made in Taiwan and as far as I can tell it looks really really really a lot alike the 94 (ish) Giant Cadex line. So is it the same frame? Hi Tomoth, you can mail them if you want. Do you perhaps have a shot of the dropouts without wheel in it? Do all the Cadexes have partly carbon seatstays? Won’t be able to take any for a few days I’m afraid but if you can post some of yours I can do the same and then it’s here for others to contribute to aswell. Here you go, mines a cfm3 which I think has cf main tubes and Alu rear. Post subject: Re: Mongoose IBOC Pro SX 94 same a Giant Cadex? Thanks Timo! This frame is different from my Mongoose. The seatstay is very different. Yours a 94? have seen pictures of other cadexes from 94(ish) that also looked different from your frame. So there has been some variation in the Cadex frames I think. Mine is correct except the dropouts, mine are fixed but the catalogue shows replaceable. I got mine as a frame replacement so did not buy new so that might explain the difference maybe? Thank you for the link! That was useful! Dropouts are another thing that is very different. The chain and seatstayare one piece with the dropout welded on it. I also think the carbon tubes are longer and the aluminium links (bb, headtube en part around seattube) smaller on the Cadex. Still, the IBOC might not have been a Giant 94 model but maybe an older one? But I am starting to think they are different. But they might have been build by Giant, would that be possible? Really sorry I cannnot help as I have not heard of you frame before. Would be interesting to see some pictures though. Mine is in process of being sanded so I stole this picture of the interwebs. Might going to make a build post out of this build.